The Turkish Coalition of America leads an effort with members of the Congressional Black Caucus to pay tribute to the contributions by the late Ahmet Ertegun to breaking down racial barriers and for his life-long dedication to promoting African American music.
" Mr. HASTINGS of Florida. Madam Speaker, I rise to pay tribute to a man who, without exaggeration, was called "the greatest record man of all time'' and whose great character and spirit made indelible contributions to the worldwide promotion of African-American music and American popular culture while also standing for racial equality and social justice. Unfortunately, we lost Ahmet Ertegun, the founder of Atlantic Records and the Rock and Roll Hall of Fame, in 2006. His legacy will live on in the music he promoted, and the legendary careers--from Ray Charles to the Rolling Stones--he helped create and develop over 60 years. PBS recently ran a documentary titled "Atlantic Records: The House that Ahmet Built.'' This 2-hour sensation chronicled the life of Ertegun from his birth in 1923 through his childhood, career, and success. We witnessed America change through his eyes, and the emergence of African-American music into popular culture with his guidance. At every turn, Ertegun and his brother, Nesuhi, challenged the prevailing racial bigotry, stereotypes and discrimination. Despite being initially denied by the National Press Club and the segregation policies of the day, they organized the first integrated jazz concert before a white and black audience in Washington, DC at the Jewish Community Center in the 1940s. They even brought hostility to themselves in hosting the now famous integrated jazz sessions at their home of the Turkish embassy residence, again, challenging the practice of segregation. While not directly following in his father's footsteps with a diplomatic career, he practiced a true diplomacy in bringing people together. 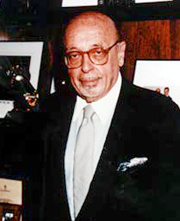 Ertegun's love of American black music led him to found Atlantic Records in 1947. For nearly five decades, Ertegun wrote and produced music, defined careers and changed the lives of household names such as Ruth Brown, Big Joe Turner, Aretha Franklin, Roberta Flack, and others and brought African American music and soul into the American mainstream. Ertegun also became a trustee of several charitable organizations, including the Rhythm & Blues Foundation, which sought to ensure that singers and artists received their share of royalties that they had for so long been denied. As mentioned earlier, he was a contributing founder of the Rock and Roll Hall of Fame and Museum, whose main exhibition hall now bears his name. Ahmet Ertegun's leadership is reflected in the inspirational careers of other Turkish Americans who continue the legacy of contributing to what makes America great. I hope that my colleagues, this great institution and the American people will join me in paying tribute to the life and accomplishments of a great American icon and a proud and talented Turk." "Mr. VOINOVICH. Mr. President, I wish to honor a celebrated American pioneer, a legendary entrepreneur, a devotee, an integral cultivator of uniquely American music, and a great benefactor both to my home State of Ohio and my hometown of Cleveland, the late music executive Ahmet Ertegun. The son of a Turkish Ambassador to the United States, Ertegun arrived in this county in 1935 as a young boy destined for diplomatic service. Yet at an early age he developed a profound love for music, especially jazz and blues, that blossomed into a lifelong, remarkable career. At the age of 24, he cofounded the independent Atlantic Records label, mounting a historic and formidable challenge to contemporary industry giants by his keen ability to scout and develop talent. In other words, he knew a winner when he met one. John Coltrane, Ray Charles, and the Rolling Stones are among those in his repertoire. An exemplary immigrant, Ahmet was well known for his "culturally triangular'' relationships: He was a Turkish Muslim; many of his fellow executives were Jewish, and many of the artists they produced were African-American Christians. David Geffen, the acclaimed entertainment mogul whom Ertegun introduced to the record business, noted that fewer people have had a greater impact on the music industry and that no one loved music more than he did. Ahmet's deep appreciation and respect for musical roots and history prompted him to establish a Rock and Roll Hall of Fame. The Hall of Fame Foundation was created in 1983, and soon after, its board of trustees began searching for a suitable home for the museum. At that time, about the midpoint of my decade as mayor of Cleveland, a regional renaissance was in full bloom, and Cleveland was making a comeback. The city had a clear vision of our new destiny and knew where we were headed. The great people of my city had a dream: to land that Hall of Fame at home, in the heart of rock 'n' roll, right where it belonged. Moved by the undaunted initiative of Greater Cleveland civic and business leaders, I joined their determined effort, boarded on a plane to New York, and pitched the idea to Ahmet and his board of trustees. Our team's stunning case suddenly made Cleveland a top contender. The news of our heavy impression galvanized the city and evoked a flood of public spirit and support that greeted Ahmet and his board upon their subsequent visit to scout the town. Well, Ahmet never lost his ability to recognize a winner, and when he stepped off the plane in Cleveland, he met one. I had the honor of presenting him with a key to our city and leading him on a local tour, showcasing what we had to offer. A few months later, Ahmet and his board reached a decision, and in their good judgment, they selected Cleveland, where the term "rock 'n' roll'' had been coined. We in Cleveland were both proud and humbled. I am pleased to report, for more than a decade, the Rock and Roll Hall of Fame in Cleveland has been a popular global destination and a success for my hometown, for the State of Ohio, and for America. I am fortunate that for a time, my duties in public services dovetailed with Ahmet's vision for the future of the Rock and Roll Hall of Fame.